With fitness, it’s not only about going through the motions, but also about going through the correct motions to get the most out of your routine. Eagle resident Kyle Sela is a physical therapist and coowner of Movement Guides, which manufactures unique fitness equipment in the Treasure Valley. Sela understands the importance of moving properly for better fitness. Movement Guides produces two customizable fitness equipment systems: The SquatGuide and T-Dot Mobility System. Eagle Magazine sat down with Sela to learn more about his approach to fitness. EM: What inspired you to start your own fitness equipment business? KS: As my physical therapy career was progressing, I continually noticed a common issue. Just about every patient I worked with could not squat with very good form, and the flaws that I saw in this movement pattern were just about the same in everyone. I soon found a really effective way to cue people into the correct position with my hands, but a few problems still existed with this method. I knew there was a way to create a device that could replace my hands but I didn’t have the means or connections to take that ideaanywhere. EM: How were you able to take that idea and turn it into a business? KS: When we moved to Eagle, I was looking for the best strength coach in the Treasure Valley to send my younger athlete patients to when they finished rehab. 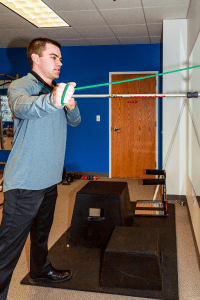 I came across Matt Wattles, who owns Competitive Edge Athletic Performance Center in Meridian, and I was immediately impressed with his knowledge and training methods. As we began to work together developing young athletes, I also learned that a friend of his, Darin Lawley, had fabricated most of Matt’s equipment. Matt set up a meeting, and Darin said he could have a prototype done in a few weeks. I could not believe my eyes when I walked into the gym and saw the SquatGuide for the first time. Soon after that, Movement Guides, Inc. was born. EM: What makes the SquatGuide unique? EM: What’s next for Movement Guides? KS: The T-Dot Mobility System is our newest product, and it improves movement in a different fashion than SquatGuide. We feel that T-Dot is the most effective and versatile self-directed soft-tissue mobilization product on the market. It allows people to identify areas of soft tissue restriction (often called trigger points), apply pressure, and then stretch that tissue under pressure with movement. T-Dot is adjustable by height, angle, and distance from the wall so you can target any area on the body, which provides a massive advantage to other products on the market. Learn more about Movement Guides at www.MovementGuides.com.